Each year when school begins, I have a need to reorganize. 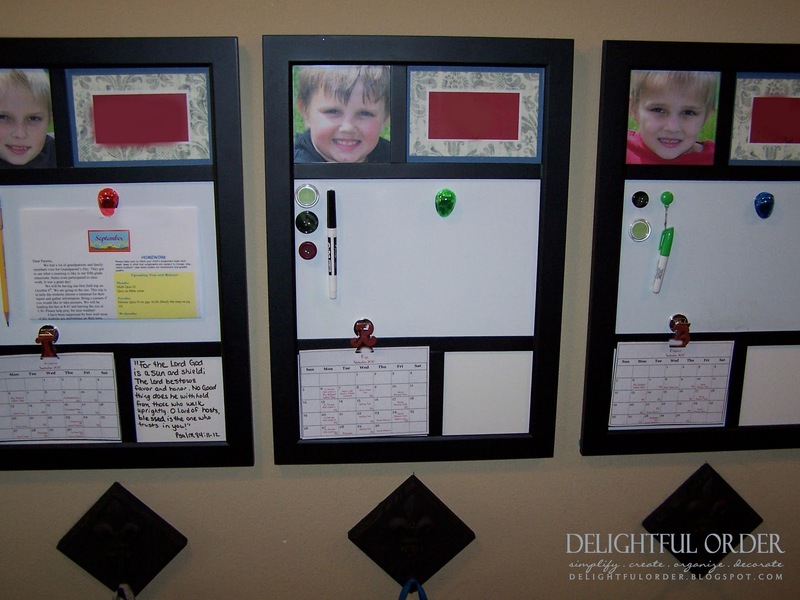 This year my first project was to come up with a system to keep track of my 3 school boys’ schedules. I customized three boards and hung them in my back entrance. 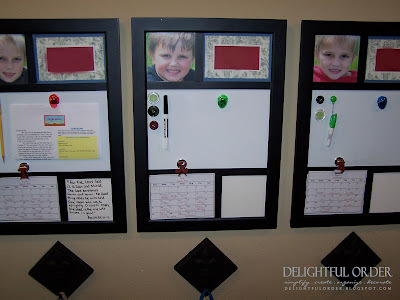 Trying to keep track of 3 kiddo’s school papers & schedules can get quite overwhelming for me, so I decided maybe this would help me feel a little more organized. My boys each have scripture to memorize every week, so I write their verse on their own bulletin boards, that way they can see it daily. Any important weekly papers get attached to the magnet board. A Calendar helps me (and the boys) keep track of PE days, soccer days, days they have tests, etc. 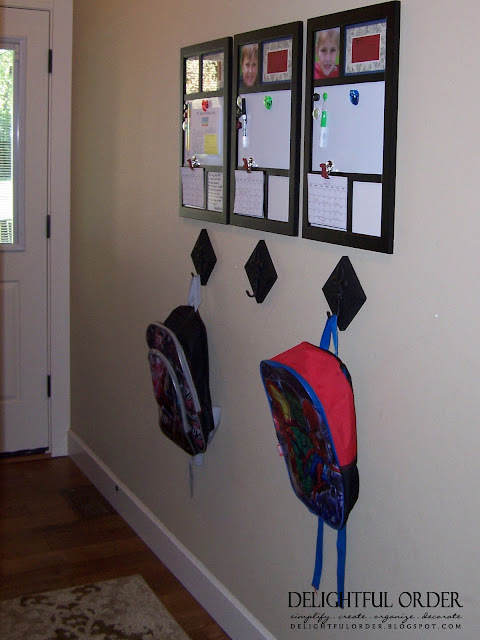 Under each board I hung some hooks for their backpacks. The 3 frames came from Craft Warehouse (on sale.) I took the glass out of the frames underneath. I bought a couple of white erase board sheets (they are the peel-n-stick kind) also from Craft Warehouse, cut them down to size & attached it to the cardboard that was behind the glass. I did this to both of the bottom sections. I hot-glued buttons to plain magnets to make my magnets a little cuter. I created the calendar in Microsoft Publisher, printed them & clipped them onto my magnet clip. The letters on the clips I had, painted them and hot-glued them on. The Backpack Hooks also came from Craft Warehouse. I bought 3 square blocks of wood (you know the unstained pieces you can buy at Craft Warehouse) & some decorative hooks, attached them (I liked the blocks at a diamond shape), painted both the block & the hook & attached them to the wall. I LOVE, LOVE, LOVE this setup. It’s been working GREAT! As much as I do LOVE this area, I have since updated it to work better for my family. GO HERE to see the new area. Wow if I had kids I would totally copy this idea; however, I might still be able to copy this idea for my own life! :) I'm your newest follower! Hope you will link this up at SewWoodsy.blogspot.com! That is way too cute! That would make a fun Christmas gift as well. Thank you for linking up to Sew Woodsy! 3 out of 4 of my kids are grown-up & gone ~ this would have worked out perfectly! They don't have children yet, but when they do I know what to make them when their kids start school! P.S. I'm new to your blog & I'm hooked! Love this idea too! I'm a follower. Great idea and I'm your newest follower! Are you dry erase peel and stick sheets also magnetic?? Love This! My youngest is starting kindergarten so now I have three in school so this would be perfect. LOVE IT! !